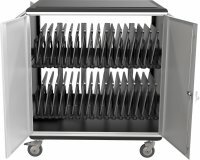 Versatile laptop or standard computer workstation with locking cabinet. For stand-up applications. 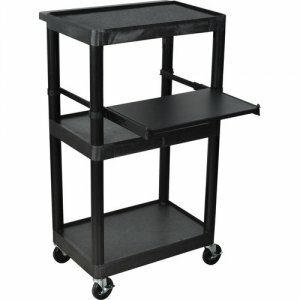 Unit includes an adjustable keyboard shelf, surge supressing electrical outlet and 4 inch casters, two with locking brakes. Integral safety push handle is molded into wide top shelf. 3-outlet, 15´ surge suppressing electric, UL and CSA listed.